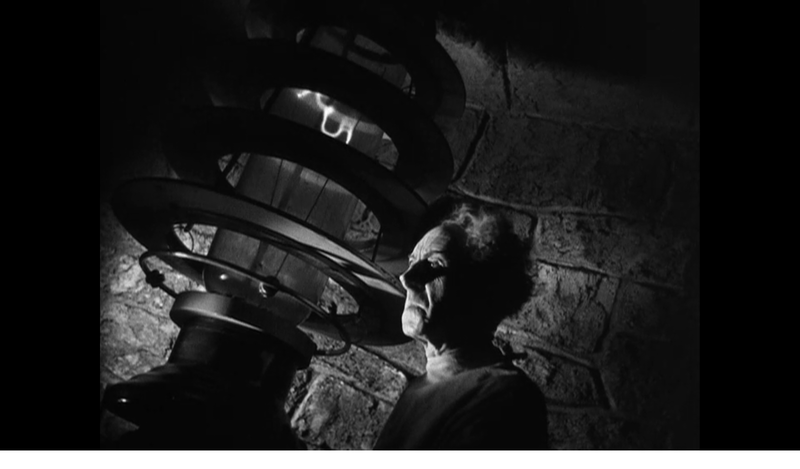 Having survived a fire, the Monster (Boris Karloff) created by Dr. Frankenstein (Colin Clive) goes on another rampage, this time seeking temporary companionship with a blind hermit (O.P. Heggie) and learning to speak a few words. 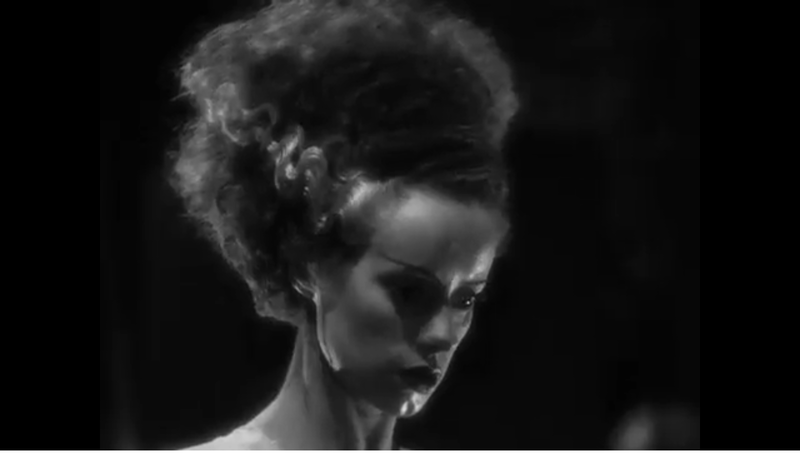 Meanwhile, Dr. Frankenstein’s former mentor (Ernest Thesiger) — obsessed with creating a race of monsters — forces Frankenstein to collaborate on his scheme to craft a mate (Elsa Lanchester) for the Monster. Peary argues that “James Whale’s stylized, stunningly imaginative, wickedly funny horror masterpiece” is “surpassed only by King Kong among the all-time best monster movies”, and notes that “not even [Kong] has as much ‘class'”. Indeed, it’s a rare sequel which is widely cited as better than its predecessor. While I’m quite fond of the original Frankenstein (I think it holds up equally well, on its own merits), I’ll concede that Bride — a darkly humorous campy romp — is even more fun in many ways. 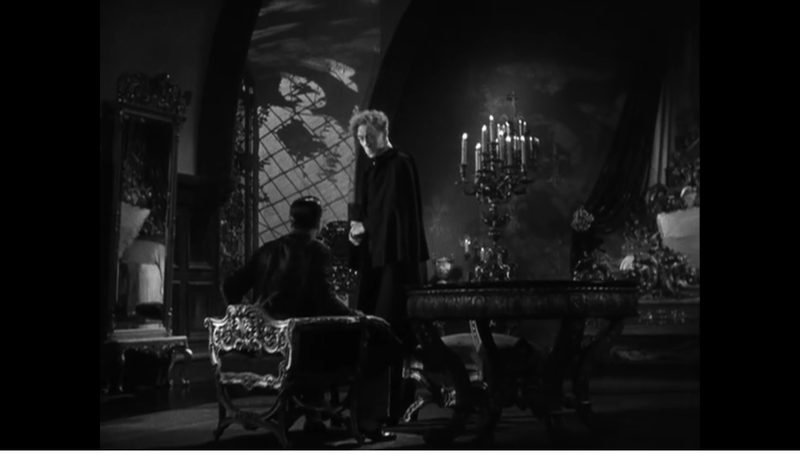 Peary notes that “there are many reasons the film is better than the original, not the least being that it deals with the Monster’s need for female companionship, which is central to the second half of Shelley’s novel”. Indeed, to that end, I would actually argue (as I’ve read elsewhere) that the two short films could/should be viewed as Part One and Part Two of the same movie, given that they possess (mostly) the same roster of actors, and were directed by the same visionary. Peary accurately argues that the 5’4″ Lanchester is “marvelous in her brief appearance as the Bride”, walking on “2 1/2-foot stilts that make her movements birdlike” — yet despite her visual dominance in our collective consciousness of this film, she’s really a very minor character, not showing up until the very end, and on-screen for less than five minutes. 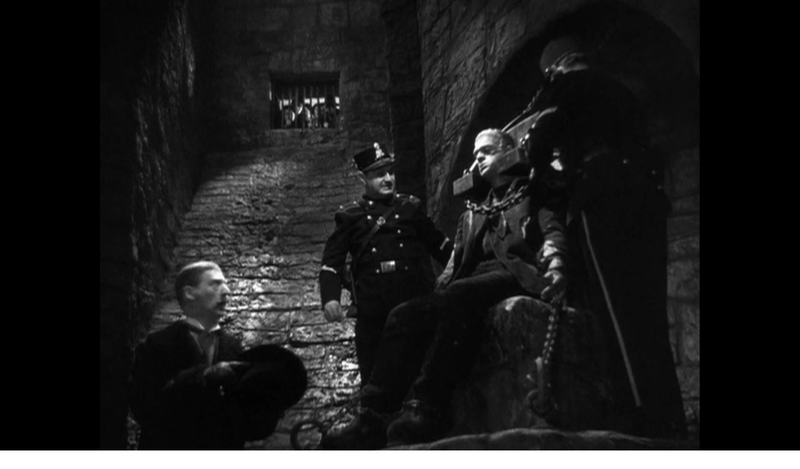 Thus, Peary’s right to note that “it is Karloff’s touching performance” (as in the original) “that makes this film great.” While he’s “almost hidden beneath Jack Pearce’s remarkable make-up, his sensitive eyes still come through, expressing the Monster’s feelings”. 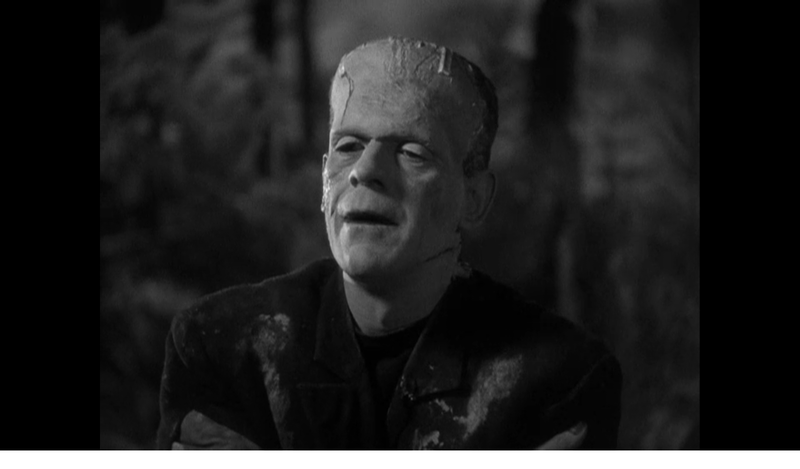 Peary sums it up perfectly: “With Karloff in the part, the Monster is eloquent even when silent”. Just as memorable, however — and arguably an equally essential ingredient in the film’s success — is the bold performance given by Thesiger as “one of the genre’s most eccentric scoundrels”. 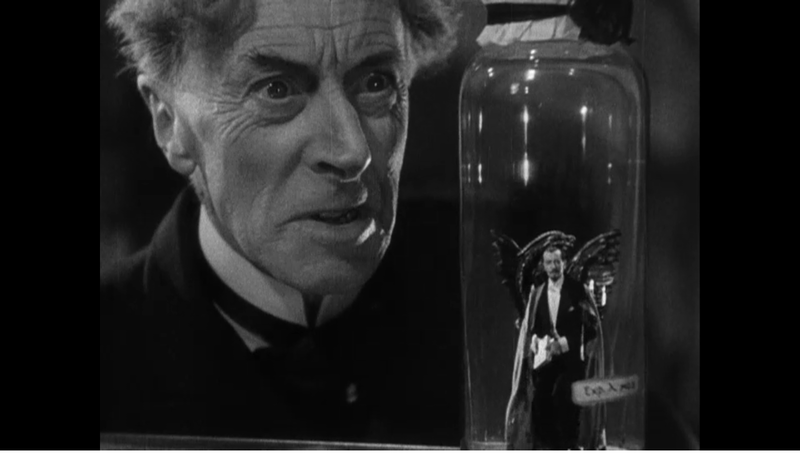 Whenever this angular villain is on-screen, we simply can’t look away — particularly as he’s showcasing his display of miniaturized humans, each perfectly realized, and reminding one of the expert special effects work done a year later in Tod Browning’s The Devil Doll. Yes — as one of the undisputed classics of early horror. It was all the more pleasurable to return to ‘BOF’ having just revisited the very weak ‘Son of Frankenstein’. In ‘SOF’, just about nothing of real interest happens – and there’s approximately 25 more minutes of tepid nothingness in it, as compared to the very compact running time of ‘BOF’: a mere 74 minutes. Not only does ‘BOF’ use its time wisely, but it seems to have an endlessly creative succession of incidents. It’s a very full and satisfying piece of cinema. I wouldn’t go so far as to stamp ‘BOF’ as campy in any way, really – but it does have a strong gay sensibility (which is a different thing; a kind of harnessed camp). Whale, an out director in Hollywood at a time when being out simply wasn’t done, clearly approached his sequel with less overall reverence – having apparently decided to have more fun as a director. As a result, ‘BOF’ is often funny – in the sense that the material is being taken less seriously than that of the original ‘Frankenstein’. That said, Whale was clever and sensitive enough to know when to give a scene the respect it deserved – note that the scene involving the blind man is quite touching and not heightened for effect really at all. The main ‘gay’ through-line of the film is afforded by the casting of Thesiger. Reportedly something of a queen in real life, Thesiger emits quite a gay glow here, gleeful as he is in his subversively dark nature. Although Thesiger’s Dr. Pretorius is evidently beyond any real sexuality, his confidence is that of a jaded homosexual who cannot be shaken, much less thrown. Note his particular sense of pride as he announces Lanchester as “the bride of Frankenstein”. My only quibble with the otherwise strong screenplay is in the monster’s quickly growing ability at speech. He goes from learning a few simple words to having something of a real working vocabulary – when that doesn’t particularly make much sense. But, since the film works so well, that’s a small bit of beef. Easily the best of the Universal series and a true cinema classic; everything works beautifully here.